Google Backers Back Aster Data Systems. 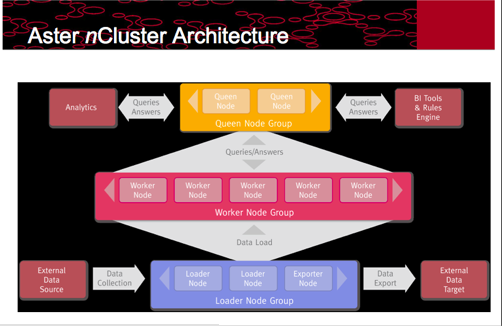 It's All About The Clusters. Google and Yahoo had to build this infrastructure for themselves. Others don’t have this. So we will give them a very scalable database, and keep costs low by running it on commodity hardware. Bawa and his co-founders were Ph.D students at Stanford when they founded the company in July, 2005. They raised an angel round of about $1 million in November, 2005 from Stanford computer science professor David Cheriton, Josh Kopelman at First Round Capital, Anand Rajaraman (founder of Junglee and Kosmix), and uber-angel Ron Conway. Cheriton was also one of the early angel investors in Google. Another Google investor, Sequoia Capital, took the entire A round in May, 2007. The company is not disclosing that round, but it is believed to be around $5 million. AsterData give companies deep insights on massive data by transforming off-the-shelf, commodity hardware into a powerful, self-managing, and scalable analytic database. Data analysis that previously took days to run (or were impossible to run) now routinely finish in minutes/hours. They already have paying customers today and Aster is in production managing billions of events per day. It’s a data driven world, and the old-style databases just can’t keep up.